When the Sega CD launched in 1993, it was heralded as the first mainstream foray of video gaming into the Multimedia Revolution. Sega, as well as all third party companies involved, were touting the capabilities of the CD medium as the next logical step in the evolution of the industry, and the one thing that was truly needed was games that couldn’t be done on a cartridge. By and large, most of the software initially released for the pricey add-on failed to live up to this vital criteria, but there were a few games that managed to shine through, if not for being perfect new examples of innovative and exciting gameplay, but for actually taking advantage of the hardware they were on. The Adventures of Willy Beamish is one such game. Though it might not look like it at first glance, the immense amount of work that went into it is something that needs to be recognized and appreciated. Developed by Dynamix and originally released by Sierra Entertainment for home computers in 1991, the 1993 Sega CD version is generally regarded as being the same game with true voice acting and some minor cosmetic changes. This might very well be true, but it at least demonstrates the foresight Dynamix had in beefing up its port in order to benefit from all the bells and whistles the new format had to offer. The original game was an idea crafted by Jeff Tunnell (Tribes, Rise of the Dragon), who envisioned the PC as a great medium for creating an interactive cartoon. He joined forces with artist Sheri Wheeler, who had worked for Disney and Filmation Studios, and began to experiment with different concepts about Willy and his universe. When the character finally took shape, the wizards at Dynamix began the arduous task of fusing those techniques used in traditional animation with the latest computer technology. Wheeler enlisted the aid of two more accomplished artists, Rene Garcia and Pat Clark, and together they set out to bring Willy to life. Former NBC and Family Home Entertainment writers Tony and Merle Perutz drafted the story, and they collaborated with Tunnell on the puzzles, as well as the character dialogue and origins. Their efforts were built upon by the graphics artists, who put the entire game into storyboards. Once they were approved by Tunnell, the artists began to draw and paint the backgrounds. Many scenes were painted by hand, scanned into a computer, and then colored using a special program. After the character cells were finished, they too were color scanned and united into animated sequences (called “aims”). These were laid over the digitized backgrounds. The computer would then play the animated cells over the background, which created the full sequence. This animation could be fast forwarded, rewinded, and even looped, giving the artists the best impression possible about how the actual game would look in motion. The time-consuming process took several months to complete, with Tunnell overseeing every step of the operation. At the time, Tunnell was directly supervising several projects, including Rise of the Dragon and Heart of China. Though the work load was immense, he was determined to ensure that the game was as close to his original vision as possible. In total, seven full-time animators and a team of forty members worked almost non-stop for a year to complete the project. The Adventures of Willy Beamish was both critically and commercially successful upon its release, but Tunnell still saw ways to improve the experience. The computer industry was was making great strides in storage, and compact discs provided more than five hundred megs of storage. This massive, new technology intrigued Tunnell, and he turned to CDs to give his baby the facelift he needed. He also turned his gaze towards video game consoles as another means of expanding sales. Knowing that none of the then-current cartridge-based consoles were worth considering, Tunnell saw the Sega CD as the best place to make it happen. Welcome to the Next Level? I suspect that what made Willy Beamish take so long to load wasn’t the polling aspect, but badly laid-out files on the CD. Here’s why: CD drives were never intended to be random-access data storage devices. They were designed specifically for streaming audio data. The spindle speed is different for each track on the CD — the spindle motor has to speed up or slow down every time it moves to another track. With audio CDs, the laser normally only ever moves from one track directly to the next, so the spindle motor only changes speed very slightly. But with a data CD, every time you open a new file, the laser has to move to the innermost tracks where the directory is stored, read the directory, then move back out to where the file is. So there’s a big slowdown and a speedup with every file open. This takes time, as the inertia of the CD means that it can’t change speed instantly. Furthermore the actual time to move the laser itself is non-trivial — again, it was never intended to be used this way. 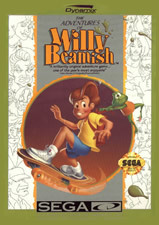 Porting Adventures of Willy Beamish was further frustrated by the uncooperative attitude of Sega management. Much to Tunnell’s dismay, Sega was in full “god mode” (a video game term that equally applies to those market leaders who think they are infallible, as Atari and Nintendo once had ) and wasn’t exactly warm to Tunnell’s ideas. Illogical, if you think about it, as Sega should have been courting developers left and right. The Sega CD would need as much help as it could get, and this attitude didn’t endear the company to anyone. Thankfully, Tunnell finally got the green light and received Sega CD dev kits. His team was excited at first about working on one of the best-selling consoles around and saw Adventures of Willy Beamish as an opportunity to spark sales of the fledgling CD peripheral; however, as time wore on, this attitude would change. Work quickly began on the port, with the audio receiving the bulk of the enhancements. Each of the forty-two characters were cast and recorded by professional voice actors. The dialogue was made digital, which itself was a massive undertaking. Synching the voice overs with the character’s lip movements is problematic in its own right, but this was compounded by the fact the original game used text boxes instead of facial animation whenever someone spoke. For this reason, most of the original game code had to be rewritten. Luckily, the soundtrack was much easier to work with, and it had everything to gain from making the switch to CD. Composer Chris Steven’s score was given the digital treatment, and entirely new tracks were recorded. Getting the game to market was an exhaustive effort that took an entire year and in the end involved more than fifty people. Tunnell became disenchanted with the Sega CD’s limitations and was disappointed at how it fared at retail. Sid and Al’s Incredible Toons, a Dynamix game in development late in the system’s life cycle, was cancelled, and the company moved on to other platforms. He later remarked that he never would have even attempted at porting Adventures of Willy Beamish if he had known how things would turn out. A sequel was tentatively planned, and Tunnell states that he had even gotten so far as to create a storyline and some puzzles for it. Unfortunately, nothing ever materialized. Tunnell was burned out and decided that he needed a change of atmosphere. He left his programming role within the company shortly thereafter to work on smaller projects at Jeff Tunnell Productions, a new start up he began with some friends from Dynamix. This more or less killed all hopes for a sequel, and no mention of Willy’s return has been made since. Say what you will about the annoying load times, but overall Adventures of Willy Beamish is a great game and one that every Sega CD owner should play. The additions of new animation, voice overs, and a digital soundtrack enhance an already great adventure that was a true test of the early efforts of getting the most out of CD-based platforms. This is something we don’t even think about today, but it was a major hurdle for programmers and designers of the early ’90s to overcome. In that regard, Jeff Tunnell’s rambunctious preteen holds a special place in Sega history. Adams, Earnest. Hardware Designers, Talk to Us!. Gamasutra. October 23, 2003. Horowitz, Ken. Interview with Jeff Tunnell. Sega-16. December 2, 2005. Omni. Interview with Jeff Tunnell. Armchair Empire. June 29, 2003. The Making of Willy Beamish. Sega Visions Magazine. February/March 1993.